Impress Blinds features a wide range of luxury blinds at very competitive prices. Available in multiple colours, styles, texture and slat widths, our stylish window blinds are ideal for creating a stunning visual point at your home or office. Having a dedicated and experienced team, we’re committed to providing you the best window treatment in the Crewe (Cheshire) and all over the UK. We offer the cheapest blinds made of the high quality material, reducing the heat while allowing you to control the light levels. Each blind is made to the highest standard to achieve the perfection and give your territory a unique look while making it a relaxing space. With a huge spectrum of hues, patterns and designs, our extensive line of window blinds includes vertical blinds, wood blinds, vision, Venetian blinds, conservatory blinds, roman and roller blinds. Impress Blinds has built a strong reputation due quality products, cheap window blinds rates and exceptional services. We proud on serving our huge client base in Crewe (Cheshire) and all over the UK with the exceptional quality window blinds and window treatments. From choosing the right window blinds for your home or office to measurement and fitting, our efficient staff will provide you the quality services. 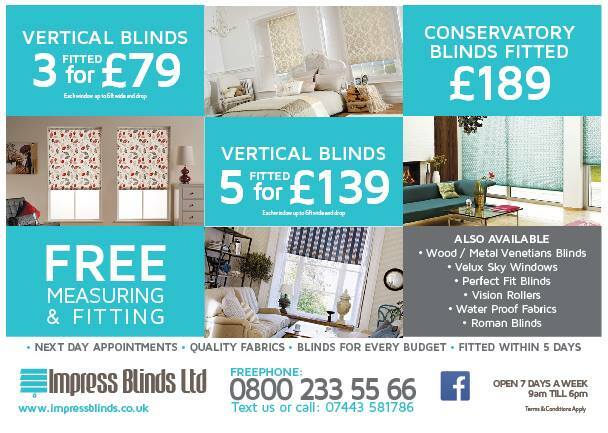 Whether you need expert advice for selecting the right style or looking for professional installation services, Impress Blinds offers free consultation, measuring and fitting service in Crewe and throughout UK. Our partners are available here in the Crewe to guide and deliver the material to our clients. So, we ensure you fastest delivery of your selected window blinds at your door step. We supply high quality and cheap window blinds in Crewe (Cheshire) and throughout in UK. Impress Blinds has built reputation by delivering quality products and services. Though we offer cheap rates but we don’t compromise on the quality of our products and services.